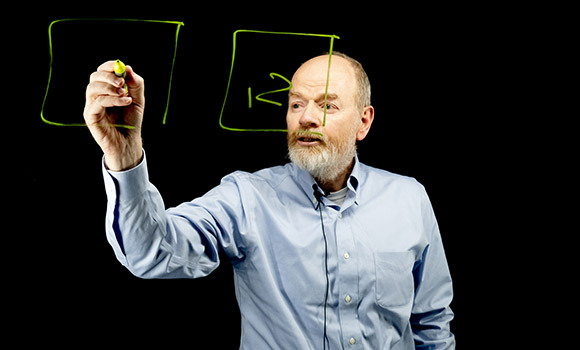 Dr. David Upton uses the lightboard studio in the new UTLC production suite to record lectures for his class. UNC Greensboro’s University Teaching and Learning Commons (UTLC) has opened a new production suite to help faculty incorporate technology into the classroom and transform the learning experience for students. The new space also includes virtual reality technology. Amy Brown, assistant director of technology enhanced pedagogy, shows Emily Savoie DiRoma, assistant director for tutoring services, how to use the one-button video recording studio. UNCG’s Learning Technology group, a team of Information Technology Services staff that works in the UTLC offices, officially opened the space in the fall. Based on feedback from faculty, the team has re-envisioned the space and recently reopened the suite after making some changes during the winter. Because the suite is housed in the UTLC, faculty have the opportunity to first meet with the UTLC Teaching Innovations Office staff to discuss pedagogical approaches and goals, and then meet with the Learning Technology team to figure out how to best support pedagogy with technology. 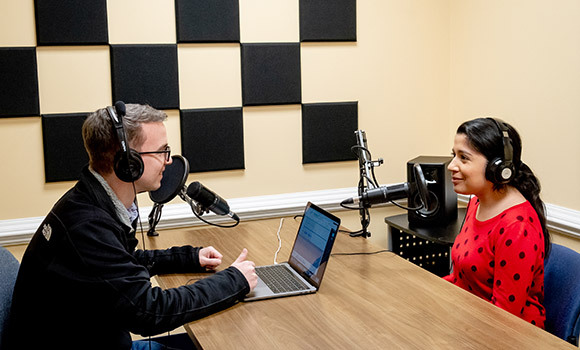 UTLC staff members Dr. Ben Peterson and Marisa Gonzalez experiment with the podcasting studio. One faculty member who has taken full advantage of the space is Dr. David Upton, associate professor in the Department of Accounting and Finance. Upton attended a workshop in February, and since then has regularly visited the suite to record lectures for his courses. Specifically, he uses the lightboard studio to create videos that introduce key concepts. 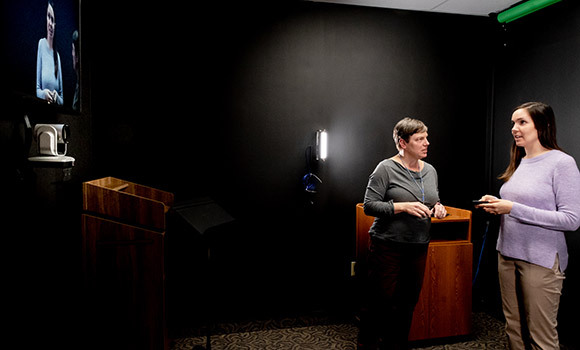 Dr. Sarah Gates, an instructor in the Bachelor of Arts in Liberal Studies program, started using the space in the fall. Faculty members interested in learning more about the production suite are encouraged to sign up for one of the upcoming one-hour workshops. Workshops will be held March 21, March 25, April 18, and April 29. Space is limited for each session. After completing the introductory workshop, faculty can begin to reserve and use the studio spaces. To register for a workshop, visit the workshops and events website. To learn more about the UTLC, visit utlc.uncg.edu. View a demonstration of the lightboard studio in the video below.